Are you itching to undertake a renovation project just so you can inject some of your own ‘sweat equity’. You know, getting down and dirty, getting on the tools, saving a few bob by doing it yourself… good ole DIY? Doing the work yourself is a sure fire way to save money while also feeling that sense of achievement. There is nothing more satisfying than assessing the end result of a project knowing that you’ve done it yourself. 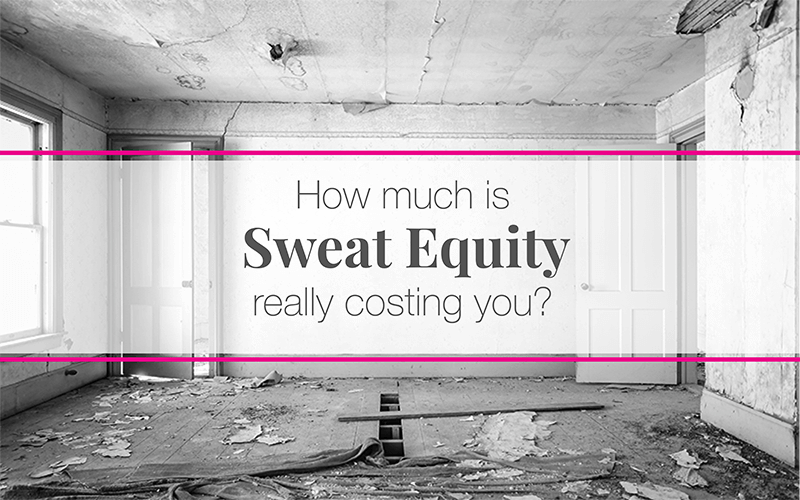 However, how much is your sweat equity really costing you? Many people undergoing a DIY renovation without fully stopping to assess the cost of DIY and sometimes, the costs are far more than you would realise. This sounds like a contradiction right? You are doing it yourself so you can save money, so how can it cost you money? Easy, when you DIY and the results are bad. Or you’ve made a mistake and have to start again. Or you need to buy more products and material because you measured incorrectly and it’s wrong. Weigh up the chances of all these happening and evaluate if it’s really going to save you money by doing it yourself. DIY is great for saving a few bucks. But if you consider how long it would take you to complete a task over a qualified and experienced professional, then how much is it really saving you? Let’s say, for example, you decide to tile a bathroom yourself. If you have no experience in tiling, but thought you’d give it a go, how long do you think it would take? It could take you a week or more to do the same job a professional could do in two days. Do you have the time? Time is money! Okay, so you’ve decided to go all in and do as much work as you can yourself. Great! But have you stop and thought about the end result? How will the end result look? Will it look like a DIY project? If you are renovating to sell the property, how is a DIY result going to look over a professional job? And how much is this going to impact on your sale price? I have seen some amazing renovations where the work done by DIYer looks fantastic and you would not be able to tell it apart from professional work. But I have also seen some pretty dodgy DIY jobs and when costing up the feasibility, I will calculate the price this as if the work needs to be done again from scratch. You need to know your limitations and know when it’s best to leave it to the professional. With thousands of people every year undertaking DIY projects, many of those will suffer an accident resulting in injury or death. If you don’t know your limitations or you try to do something your just not qualified to do then it can cost you dearly. Before undertaking a job yourself, ask yourself if you are confident that you can easily complete the task safely, and thoroughly assess the dangers before starting. When you next decide to invest some sweat equity into your project, make sure you are doing it with eyes wide open so you are well aware of what you are getting yourself into and what the likely outcome is going to be. When is it time to call in a property buyer’s agent? Great advice Katie, I have often found that getting professionals or experienced handymen in and project managing the work is a more cost effective way of doing things for us. I’ll tackle smaller renovations such as replacing a splashback or installing towel rails, especially in properties we are renting out, but the professionals get the rest. I watched a neighbour spend a few weekends pulling down an old deck in their spare time and then rebuilding it in cheap pine, they would have lost 4 – 6 weeks in rent and, although less than a year old, it looks sad. Oh no, what a waste of time and money. Katie I couldn’t agree more. We spend a lot of time fixing up people’s DIY attempts. We’ve bought houses that were ‘started’ and looked terrible. Great for the purchase price on our part, but they would have been better off leaving the house alone if they really didn’t know what they were doing. My main concern though is asbestos. Do people really know what they are dealing with and what are the long term costs on their health and the health of their children. It is horrible stuff and is in more than just the walls. A good reminder to people that it’s not as easy as it looks on TV. Asbestos is definitely a worry. I think there are a lot of people who don’t consider or overlook the impact it causes if not handled correctly.